Are You Suffering From Stress On Your Brain Stem Without Even Knowing It? Stand in front of a mirror and close your eyes, help do you have more weight on one leg than the other? Open your eyes, notice your head, is it vertical? Or is it leaning to one side? Notice your shoulders; is one higher than the other? Is your body leaning to one side? Place your hands on the top of your hip crests. Is one higher than the other? Do they feel twisted? Is your belt uneven from side to side? Notice your walk, do you feel that you ‘favor’ one side? Turn your head and your body; can you move more to one side than the other? If you said yes to any question, suspect a spinal misalignment with stress on the spinal cord or brain stem! Before more damage occurs, make an appointment to get your spine checked. If you decide to go on living with the stress on the spinal cord and brain stem, your spine will continue to degenerate and associated symptoms will continue to appear. When the forces of an accident or injury come into our bodies, they tear loose the connective tissue that holds our spine in place. 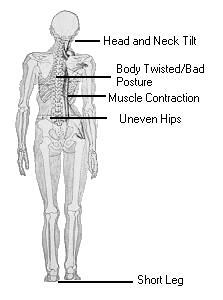 This causes a weakness in our body that allows it to break down and our spine becomes misaligned and puts stress on the cord and brain stem. This misalignment shows up as a long or short leg, a high or low hip, a twisting of our body, abnormal muscle contractions that lead to abnormal motion and wear and tear to our bodies. 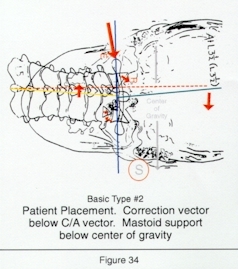 The National Upper Cervical Chiropractic Association (NUCCA) has developed a sophisticated procedure to analyze and correct a person’s unique spinal misalignment in order to restore normal cord and brain stem function.